July 22, 2018 - Lake Forest (Calif.) - L.A. Wolves FC had its request to defend denied. 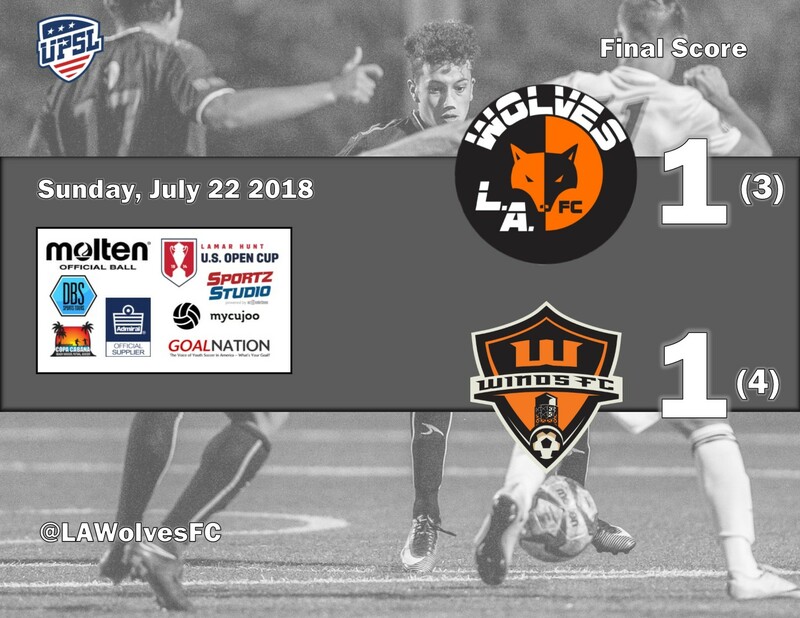 Undone by missed opportunities and a non-penalty call, L.A. Wolves FC played to a 1-1 draw with Santa Ana Winds FC before falling in a shootout, 4-3, in the United Premier Soccer League (UPSL) Pro Premier Western Conference SoCal Division Semifinals at Lake Forest Sport Park. "I'm not disappointed in my team at all. We played a (heck) of a game and I'm very proud of the individual and team effort," L.A. Wolves FC Head Coach Felipe Bernal said. "This is a top group and they gave a good performance. Sometimes you come up short." L.A. Wolves FC, the No. 2 seed from the SoCal Division, finishes the UPSL Spring Season with a 9-4-1 record. It's the second consecutive season that Wolves FC has been knocked out of the UPSL Western Conference playoffs by Santa Ana Winds FC. "We left a few too many open spaces for them to find, but we were right there with them," L.A. Wolves FC Assistant Coach Jose Hernandez said. "Penalty shootouts are 50-50 things. We were unlucky there." Jordan Gorman scored to give Winds FC the lead midway through the first half, and Justin Saul equalized with a cheeky heel kick for Wolves FC in the 41st minute. Wolves FC made a change up top and went on the attack to start the second half. In the 52nd minute a long rebound set up Dabe Anyadike for a shot that the pacey winder placed squarely on frame only to get blocked at the goal line. The referee firmly blew his whistle and stopped play as it appeared to be a deliberate handling call and a penalty shot. But after a long delay and conversations with his assistants, the referee dropped the ball for the goalkeeper and resumed play; No caution, no send off, no penalty kick and no explanation. Regulation time ended in a 1-1 draw, and Saul shot over the bar in the first round of the shootout. "(Saul) missed some chances but we all did. When he misses we all miss, and tonight he might have been a trying too hard," Bernal said. Julien Guy, Larry Sanchez and Ruben Alvarez converted from the spot in the shootout Wolves FC, but Winds FC goalkeeper Quinn Harter stopped Mason Klerks' fifth-round attempt to end the game. "It was a good, testy game. The kind of game that's a testament to the quality of the league and the strength of these teams," L.A. Wolves FC President Yan Skwara said. "Congratulations to Santa Ana Winds FC on pulling this one out." Winds FC advanced to play Sporting San Fernando in the SoCal Division Final on Saturday, July 28, at Lake Forest Sports Park.